Now the CII have released the exam paper from their April R06 exam, it’s time once again to see how we did in our pre-exam analysis. 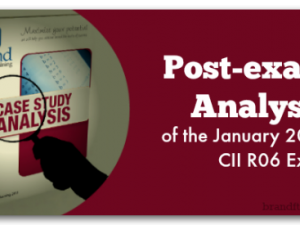 If you’re sitting the CII R06 exam in July, then you’ll want to read this. This case study focused on Laurie and Danielle, a married couple with two dependent children. The first question was ‘explain to Laurie and Danielle the potential benefits of receiving and acting on advice from a qualified financial adviser’ – we covered this in our generic questions section; a new section that was added to cover just this type of question that could potentially be applied to any case study. It’s an important section which we will continue to add to as more generic type questions are tested. 10 marks were on offer for question 1 and we had 10 bullet points so we hope this gave the candidates a confident start. The paper then moved onto the ‘state the additional information’ question, and for this couple, focused on their children’s future university education. Our analysis also covered this in full, meaning most of the 15 marks on offer could comfortably have been achieved. Next, delegates were tested on the benefits of Laurie staying as self-employed (4 marks) or incorporating his business (6 marks) – we covered the benefits of him incorporating his business in full with more than enough points to get the 6 marks and although we didn’t cover the benefits of him staying self-employed, we did cover the drawbacks of him incorporating, so the quick-thinking delegate could easily turn the drawbacks of one into the benefits of the other. Delegates then had to comment on existing protection arrangements – as well as recommending and justifying a policy to cover accident or sickness. 22 marks were on offer here and we are confident that anyone using our analysis would easily have picked up the majority of these. The final questions tested debt consolidation loans and the suitability of their mortgage repayment strategy – we had some information that could have helped with the latter but not unfortunately the former. This useful post takes a look at the questions that came up on the #CII’s April #R06 exam. The second case study can often prove to be the more challenging of the two scenarios, although on first glance, it all seemed pretty straightforward with this couple, Horace and Sarah. Delegates had to comment on the suitability of their savings and investments and state additional information needed (20 marks for the two) – we had the ‘comment on’ question fully covered and some of the information needed to answer the second part could have been taken from our model answer to aim 1. The paper then tested the use of capped drawdown which we had some information on and hope that with pension flexibility being such topical news in April, most advisers will have been able to fill in any gaps with a certain amount of ease. The ‘recommend and justify’ question was on maximising tax efficiency and was easily covered in full, adding 12 more marks to the cumulative total. Most of the marks should also have been gained on the question around loaning their son a deposit for a house. Although we were prepared for several questions on equity release, we didn’t cover specifically the information the CII wanted on the day so a potential loss of marks here. Finally the last question, and delegates will have been pleased to see it was on the factors to consider for an annual review – 8 easy marks for any well prepared student. All in all we consider this to have been a fair exam paper with not so many of the annoying curve balls that have cropped up in the past. The pass mark for R06 is 55%, and we are confident that anyone that used our analysis to prepare for their exam should have easily achieved this. If you’re studying for your R06 exam, and you’re not 100% confident of a pass, grab our free case study analysis, from an earlier exam sitting, to see the analysis layout and content style for yourself. 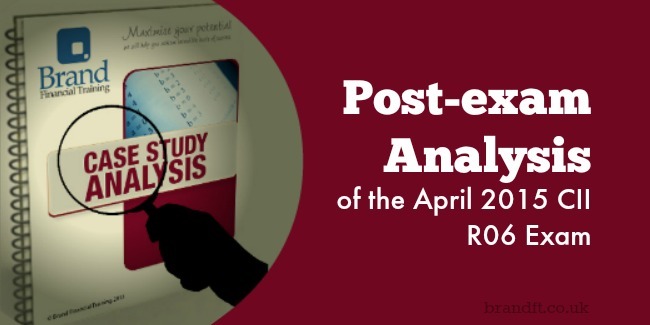 Click the link to download the R06 free case study analysis now! If you’re sitting the exam in July, how do you think you’ll do? What aspects of it do you think you’ll find most challenging?